GQ has generously supplied me with GMC-500+ counter for testing, and I am running it through its paces. Not bad for a blind development (well, not quite, because user the_Mike was very helpful with his eyes on his 500 counter, thanks!). The new case is only slightly larger than that of the old 300 counters, but seems more sturdy and in a more modern design than the old, boxy cases. The buttons are also improved, but I doubt I will ever become a friend of the button concept of the counters. The display is about twice as large and much easier to read, though it does seem to have only the same resolution (dots-per-inch) as the old ones. Which, however, suffices. The display shows CPM, CPM1st tube, CPM2nd tube, well readable. CPM is the sum of CPM1st and CPM2nd. Hmmm. From all possible things one can do with the CPM1st and CPM2nd counts, showing the sum of them is the least meaningful. Even if these were two identical tubes! My suggestion: scrap the CPM completely and only show 1st and 2nd! Then in a bigger font. And while you're at it: the unit "Roentgen" had been deprecated some 40 years ago and replaced by Sievert. Is 4 decades not enough for GQ to follow suit? Removing it has the advantage of saving real estate on the display, which could be used for �Sv/h for the 2nd tube. The M4011 had been a tube of clear glass, and you could see some rainbow colors probably from internally evaporated metals. It is now a tube encased in what seems to be a black plastic cover. Perhaps the consequence of light-sensitivity which I had observed earlier? http://www.gqelectronicsllc.com/forum/topic.asp?TOPIC_ID=4540 Based on limited experiments, so far it does not seem to have a negative impact. Do other GMC-500(+) owner also have black tubes? One problem: the name as printed on the tube remains 'M4011'. Be aware of potential confusion when you shop for M4011! The counter has only a single High-Voltage (HV) generator, so both tubes must live from the same voltage. I used a good Digital Multimeter (6000 counts) with 10MOhm internal resistance and a 1 GigaOhm precision (1%) resistor in series. This means I will measure a voltage, let's say 4.000V, and must multiply with (1000 + 10) / 10 = 101 to get a true voltage of 404V. I measured a slightly fluctuating voltage of 376...379 V. This voltage is low, even below the recommended operating range according to some websites. For comparison I measured voltage at M4011 of my 300E+ counter and got 395V. Is below 380V really the intended voltage? The problem I can see is that with increasing count rate, the current drawn from the HV increases, and due to the high internal resistance of the HV source, the voltage will decrease further. You can see this effect by measuring the voltage without the 1GOhm resistor directly in the 1000V range of the DMM. Instead of 376...379V it will show only 133V; this is normal. But when you start at the bottom end of the working voltage, any further decrease will get you out of the operating range, which is particularly bad for a device built with a 2nd tube intended for exactly those conditions where it might not work any more? While the calibration factor of 0.0065 �Sv/h/CPM for the 1st tube, the M4011, has been taken for granted (without any data ever presented to support this claim) the calibration factor for the 2nd tube, the SI3BG, remains elusive, even as a factor relative to the 1st tube. All evidence available suggests that it is higher than the claimed 0.194 �Sv/h/CPM, meaning its sensitivity is not only 30time less than the 1st tube, but 60, 100 or even 500 times less! One problem is that we don't have gamma sources with a high count rate available, and while you get higher count rate with beta emitter, the results are not necessarily meaningful to compare gamma sensitivity. Alas, you have to live with low count rates and compensate with long measurement times to get the statistics right. My gamma source was a gas mantle of the type which contains Thorium (Th). But Th is a strong beta emitter (and alpha emitter too, but we don't see them anyway), so in order to make it a gamma source, I shielded it with 2 sheets of 1mm each steel. That should absorb all betas (see my Potty Training). Taking the backplate off the counter, and putting the gas mantles as close to the M4011 tube gets you up to several thousand CPM. After shielding the betas, only some 100 CPM are left. And for the 2nd tube we are talking single digits CPM. So first I measured background, then my Th-gamma-source. Note the counter scale, left scale, is logarithmic, just so you see something. Both tubes did respond. I cannot emphasize enough the importance of checking the Poisson Plots to make sure that you got a good measurement, and nothing unwanted has happened. Here are all 4 plots, and all justify to conclude that the data are proper. The SI3BG tube is 72 times less sensitive than the M4011 tube! I.e., if the calibration factor of the M4011 is 0.0065 �Sv/h/CPM, then the cal factor for the SI3BG is 0.0065*72 = 0.468 �Sv/h/CPM. With the corrected calibration factor, the curves overlay. As they should. But note that this result is strictly applicable only for a gamma spectrum from Th shaped by shielding with 2mm steel! I think this is so far the best experiment to determine the calibration factor for gamma for the SI3bg tube, and it is far away from the 0.194, aka 30 times less sensitive! For any claims to the contrary - it is really easy to convince a physicist by showing data! The hardware version of the GMC-500+ in the picture is outdated, V3.1. Both Stargazer and I have the GMC500 V3.4 20180205 printed close to the battery. Previously, we have seen that there have been important changes in how the new hardware behaves vs. the old ones (EmfDev couldn�t reproduce several bugs in his old hardware). I wonder if the low voltage problem has been fixed or made worse in the new hardware, as I do not have a 1 GOhm precision resistor to check that (and they look expensive!). In the specs of the SI-3BG (http://www.gstube.com/data/2486/), the voltage is required to be between 380 V to 460 V. Maybe this is the reason for the low sensitivity of the SI-3BG compared to the video I found in (https://www.youtube.com/embed/SwIHr2Qd42o?rel=0 ), especially when the M4011 is working hard in parallel! Maybe removing the M4011 would show if it makes any difference to the GI-3BG sensitivity. Yes, the new 2018 tube included in the new GMC-500+ is also black! Technical support confirmed me that it is because the light sensitivity of some of these tubes. The sum of CPM1st and CPM2nd is something that GQ decided to do even after all the chat that we had in http://www.gqelectronicsllc.com/forum/topic.asp?TOPIC_ID=5304 . I still do not understand that. Regarding the experiment with the sensitivities, all the results are in the same direction as what we already observed in multiple experiments. At least it seems that the SI-3BG also responds to pure gamma. Yes, I was expecting a price according to other small resistors (10 x �1), hence it looked expensive, but you are right, it is only "relatively expensive". This one is the cheapest I could find here; for lower voltage (more than enough) and still more expensive than the one in your link: https://www.ebay.co.uk/itm/Through-Hole-Resistor-Slim-Mox-1-Gohm-5-kV-Radial-Leaded-1-W-1-Slim-Mo/272070757557 . For �5.66 I can buy 300g of KCl. Thanks for the analysis. My stack of Th mantles without shielding for betas gave 2.18 uSv/h/CPM. For the third point in the calibration I use 25CPM and 54.5 for uSv/h. To be clear, for primarily gamma radiation you are saying it should be 25CPM and 11.7 uSv/h. So for Th stack of mantles the betas are making up about 80% of the counts. I appreciate the mR/h display. My old meters display in only that and counts. If you are talking about the large font display you can rotate to uSv/h by simply pressing the second button (next to Power). It goes through CPM, mR/h, uSv/h. All three are always displayed in Large Font and the one you prefer is the most readable. The other two are also readable and for me, I think it appropriate have all three. @EmfDef - I think it would be helpful if you could address the SI-3BG operating voltage issue that ullix raises. What is the design voltage for the HV power supply in the 500+? On the resistor, nothing at those prices you quote found in US. ullix's won't ship to US, but UK version will ship for same cost as part. For me about a USD$12 investment and up to a month to get here. Will wait for EmfDef comment on design. 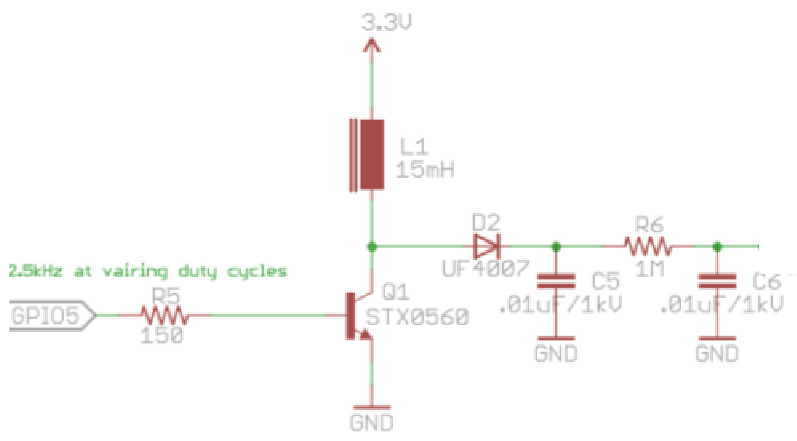 I have just checked the tube voltage with the 10 MOhm DMM (Meterman 38XR: https://datasheet.octopart.com/38XR-Meterman-datasheet-17432.pdf) and I read 135.8 V. That means either that the new V3.4 hardware has slightly bigger voltage than the V3.1 or that the impedance of my DMM is slightly different to the one used by ullix. By the way, the number of artificial counts that happen when the DMM leads touch the tube terminals (I've seen up to 320 CPS, i.e. about 19200 CPM if I keep connecting and disconnecting the terminals) could be used as an easy debug method to check that the firmware is combining both tube readings as expected. I can also confirm that the other tube (M4011) stops counting KCl radiation events when the DMM is measuring the voltage of the SI-3BG (the HV circuit is almost short circuited with 10 MOhm). That is the result of both tubes being connected to the same HV circuit, and I do not know what the effects of that behavior would be in the combined "dead time" between tubes, e.g. when one tube is in conduction and the other one receives a particle that should produce an event. And something else about the counters addition of counts. The sum of both CPM1 and CPM2 is not only shown on the screen, it is also saved to the internal memory when both tubes are selected in the firmware, but the uSv/h instantaneously calculated by the combination algorithm is not saved. Therefore, if I am not wrong, a measurement made using both tubes (especially at medium or high radiation) would require to know exactly the ratio of sensitivities between the tubes in order to be able to recalculate the individual CPM or CPS for each tube (and therefore the �exact� dose rate in uSv/h). We are now far from knowing the exact ratio of the sensitivities, and so we are missing information when saving to memory in combined mode! @ullix How did you know the internal impedance of the power supply was (relatively) high, and what do you estimate it is? Also, what impedances are you using for each of the tubes that I presume are in parallel? Finally, what led you to look at a 1 Gohm resistor and 1% quality. Just wanted to see your logic in tying all of this together. I have a 9 Mohm DMM. ikerrg stated his 10 Mohm DMM was almost a short across the tubes during measurement, and that connecting it simulated counts. How much does the impedance of the tubes drop when a detection event occurs? Any damage we can do to the meter with the 9-10 Mohm DMMs? Thanks! Just looking for a clear statement of what is occurring with the DMM measure (why 133V) and the DMM with 1 Gohm 1% res in series. Of course, all Poisson fits were checked and are ok. The difference is minor, so we define the outcome as: The SI3BG tube is 76 times less sensitive than the M4011 tube! If CPM1st = 0.0065 �Sv/h/CPM, then CPM2nd = 0.494. Well, it was a surprise to me to see how close this K40 result is to the Thorium result! With Thorium = 0.468, and K40 = 0.494, I'd finally put the calibration factor for the 2nd tube, the SI3BG, to 0.48 �Sv/h/CPM. Which makes it 74 fold less sensitive than the M4011! For any other claims, please show data! 2) Put a beta absorber on the counter, which is a sheet well covering the whole width and length of the counter, made of either: 2mm steel or copper, 4mm aluminum or glass, 150 sheets of copy paper. That should be generous for holding back all beta, while barely stopping the gammas. 3) measure both tubes for 12 hours, using GeigerLog 0.9.08ReleaseCandiate (see testing folder, preferred) or geigerlog-simple500. 4) Put at least 1 pound, better 1kg of KCl on top of the absorber sheets; make sure that no grain of KCl can see either tube! if the 2 tubes are living off of one single HV supply, then the dead time correction may have to be based on the sum of the counts of both tubes! Ironically the only time when the sum of the tubes' counts is needed! This would make such a correction even more cumbersome, and clouding the picture. Not worth doing. The most important consequence is that the correction is not only more complex (if actually accurately possible), but also the masking/loss effect of many SI-3BG tube events when the M4011 tube is working at very high count rates (when the SI-3BG is more needed). That would mean that a dual tubed device would have to be designed with two independent HV circuits to avoid that kind of interference between tubes, hence rendering the GMC-500+ useless at radiation levels where the SI-3BG tube could be useful. The option in the new firmware to measure only using tube1 or tube2 does not help, as both tubes are active and measuring events at the same time. The correction would still be useful (though negligible) for the other single tubed devices. I also did not expect that the ratio of sensitivities to gamma between M4011 and SI-3BG was lower than the ratio of sensitivities to beta (as we measured when not shielding betas in many experiments like the uranium plate). The SI-3BG is cleary designed to be a high radiation gamma detector, as I found in the original data specs commented in http://www.gqelectronicsllc.com/forum/topic.asp?TOPIC_ID=5357 . @EmfDef - We are only ignoring tube 1 counts when tube 2 is selected, as ikerrg has stated above. Is that correct? Then it appears that to effectively use SI-3BG tube in high radiation environment we would need to remove tube 1 physically from the circuit/device. Is that the correct takeaway? @ Stargazer 40: EmfDev already stated in http://www.gqelectronicsllc.com/forum/topic.asp?TOPIC_ID=5304 (read Replies #60 and #61) that it is not possible for the hardware to switch off one tube (which makes sense if both are attached to the same HV circuit). So that clearly shows that both tubes are working, and in fact, you can see that both CPM1 and CPM2 are shown on the screen even when only one of the tubes is selected. We don't know that for sure yet. It seems that it could have an effect (missing counts in the SI-3BG because the M4011 is going crazy), but how important it is the effect depends on the capability of the HV circuit to keep the voltage when the M4011 tube is having multiple events. I suppose that something quicker than a DMM (oscilloscope?) is needed to check that! @Stargazer: I looked into your question a little bit deeper, thinking that we may need a good understanding very soon. I measured voltage with and without a 1 Giga-Ohm resistor in series with my DVM. Beginning on the left side of the picture. The High Voltage generator on the circuit boards may consist of 6...15 elements. It is depicted here as the equivalent circuitry of an ideal voltage source of 392V plus a resistor in series with it of 16.12 MOhm. These two parts don't exist in reality, but one can characterize the HV gen as if they did. The 'ideal' part means the voltage is constant irrespective of the current drawn, from zero to Mega-Amperes. But before the current gets out of the HV gen, it must go through a resistor with a high resistance. Just for reference: a car battery also has an internal resistance, but not of Mega-Ohms, but of Milli-Ohms, a billion-fold difference! The HV is then followed by the Anode resistor, which is specified for each tube, and is in the range of 1...10 MOhms. This is required as part of the quenching process of the flash in the tube when a count is registered. In the 500 I think I have identified two anode resistors, one for each tube. One is R2 (top left in picture) and the other R4 (bottom left). Each has 3.00 MOhm as measured per DVM. The tube can be considered an isolator, i.e. resistance is infinite, as long as no counts come in. Thus, with no current flowing at all, the voltage at the tube is 392V, exactly the ideal-source-HV voltage. 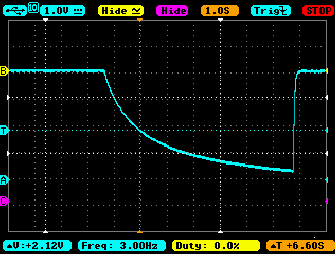 As soon as I begin to measure the voltage, some current must flow, here 0.3812�A. The 1 GOhm resistor and the DVM form a voltage divider of (1000 + 10) / 10 = 101 fold, so the measured voltage at the DVM of 3.812V must be multiplied with the factor 101 to arrive at 385V. As long as I keep my DVM connected, this is now the voltage at the tube, no longer the 392V! When I shortcut the 1GOhm resistor, the DVM is attached directly to the Anode-Cathode and measures only 134.7V, because the current has now increased to 13.47�A, and the voltage drops off at the internal resistance of the HV and the anode resistor. Based on Ohm's law U=R*I you now have 2 equations with 2 unknowns of the HV supply, so it can be solved. The numbers in the graphs are the end results, and are consistent, except for some rounding errors. I think this makes it clear why the voltage collapses with direct measurement. The choice of 1GOhm is then just something "much bigger than MegOhms" (DVM, anode resistor, expected internal resistance), and 1GOhm is convenient and available. Something bigger is also ok. But realize that you have significant leverage already with a factor of 101. Therefore choose 1% precision over (typical) 5%. Much better than 1% is not needed, because 1% of 1GOhm is already 10MOhm, as much as your DVM has, and its 10MOhm also has an uncertainty! Therefore 2 readings from 2 different instruments on 2 different device cannot be compared - when I read 134.7V and you read 133V, you don't necessarily have a lower voltage; yours may be higher, we don't know. As I cannot measure the resistance of a 1 GOhm resistor, I actually bought 3 and compared them to make sure that I don't rely on the only resistor which failed production specifications ! One more thing: you will find that DVM specs usually speak of 'impedance' and not of 'resistance'. This is needed when you take dynamic situations into account (changing voltage, pulses, counts,...) because the the capacitance will matter too. However, here we have discussed only DC situations, so resistance is ok.
A 9 MOhm DMM is almost as good as a 10 MOhm one. But now - with a 1GOhm resistor in series - you have (1000 + 9) / 9 = 112 as a factor instead of 101! I don't think you can do permanent damage to the HV gen; as you see in the picture there will be at least 30MOhm in the path. The pulses can pull the voltage down several hundred volt. Look here http://www.gqelectronicsllc.com/forum/topic.asp?TOPIC_ID=4598 in Reply #8 for some good oscilloscope pictures. As a first attempt for a dynamic effect I held my Th gas mantles at the M4011 tube directly. This gives CPM approx 4000. The voltage decreased from 385V to 379V. Where will I be at CPM=30000, 60000, and higher? Thank you both. Perfectly clear explanation on voltage changes. Removal of a tube if necessary to stabilize voltage and isolate two very different sensitivities still makes most sense to me. Because we have two slots for the two tubes, each with their own calibration/conversion, we don't have to reprogram anything but switch to the installed tube in Setup. Might even put some knobbed screws on the back to make quick removal easier without the necessity of screwdriver. Need to ascertain what exactly the purpose is of the plastic ties given the clips for the ends of the tubes. I brought my Thorium containing gas-mantles near and nearer to the M4011 tube, ending with a max slightly under CPM=5000, logging the data with GeigerLog, and in parallel measuring the voltage via 1 GOhm resistor in series with my DVM. The anode-voltage is plotted versus the Count rate; a linear (!) fit is applied to the curve, and then plotted logarithmically. Note the function of the linear fit is shown in the graph. If the AliBaba website specifications are right, then the M4011 has a plateau range of 360-440V. The bottom end of the plateau is reached at CPM=11200. In other words, the High Voltage generator is not powerful enough to support any counting beyond CPM=11200. And unless the HV supplies of the other counters are better, none of the other counters supports anything beyond 11200! They all will deliver zero counts, because there is just not enough voltage left to trigger a count. Oh, Lord. Is there any evidence that it ever worked? Please, show! So all this could actually be a show stopper, because it is hardware related and cannot be easily fixed. A counter that cannot measure more than 11000 CPM is not fulfilling the advertised specs at all! And it could be even worse in the GMC-500+, where 2 tubes are working in parallel. However, here http://www.gqelectronicsllc.com/forum/topic.asp?TOPIC_ID=4719 we can see a video of the GMC-500+ measuring above 50000 CPM. I don�t know, I am now confused! Well, I think it is clear that the 360 volts cutoff is conservative for the tube and not on-off. Just that from that point and lower there will be a reduction in accuracy that may be substantial given the slope of that curve. Extending the curve down to 325 volts or so gets you to maybe 23000CPM. Is that enough to cause avalanche effects required? Maybe? Here the same experiment done on a GMC-300E+. Squeezed the gas mantles even closer to the tube and almost reached CPM=7000, but that is the end for me. Slightly different End of Working range, but I'd call it the same as on the 400. Very likely same hardware used for the voltage generator. Speaks for a counting limit on the GMC counters much below where we'd have to worry about dead time correction. I suppose the only way to see the effect without having more radiation available is by connecting another identical M4011 tube in parallel to the present tube. The dose rate should double and also the stress on the HV circuit, leading to a clearer picture of what would happen at higher count rates. I still don�t understand vargr's video in https://www.youtube.com/watch?v=Bh5paVstB-E . Unless the tube can still sensibly count at much lower voltages, as Stargazer 40 proposed. However, the behaviour would be very nonlinear at reduced voltages, as you can see in the second page of https://www.dropbox.com/s/e0cpx8g2dh279rs/M4011%20Geiger%20Tube%20Specification.pdf?dl=0 , and the problem would then not be to compensate for the dead counts, but to compensate for the drop in CPM due to the nonlinear CPM response vs. the voltage of the HV generator! That requires much better data of the M4011 that what we have now. Could anybody from GQ please comment on all this? A limit around 15000 CPM for the HV circuit to still drive linearly the tubes would not be acceptable at all! If that is right, the accuracy at mid to high radiation levels is extremely much worse than the 15% advertised! And all this makes pointless all the firmware algorithm discussions that we have had. 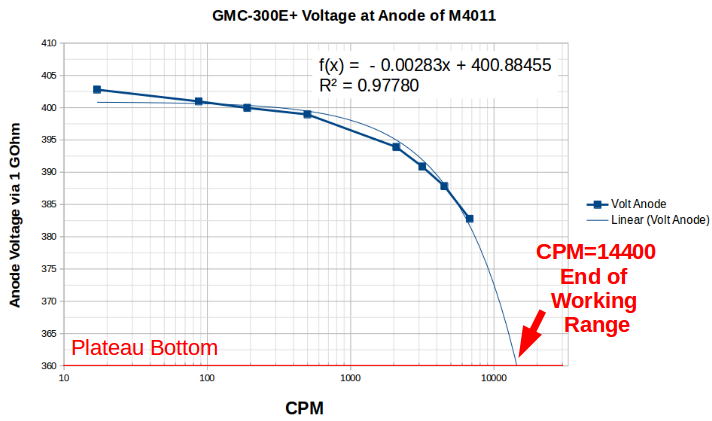 Whether starting with a high voltage or a low voltage, the end of working range as defined as recommended platform voltages are reached well beyond the ~10000CPM range of the GMC counters. I am not sure the difference 64000 to 80000 is relevant, as I can't test the very high count rates. But the RadMon+ High voltage generator has at least an about 5fold higher reach than the GMC HV generator! These are 7 simple parts. My electronics competencies may not be very high, but I can recognize that this is simple. So were there some pennies saved on an even simpler design, that turns out to not perform sufficiently well? Are there any experts here who can comment on the circuit? 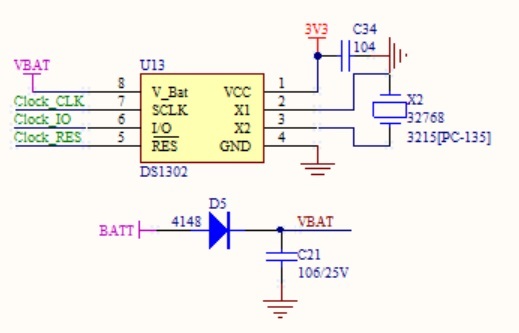 What can be done to improve even this circuit? Improve means: to further reduce the internal impedance. As we know now, when we start at the high end of the plateau with low counts, we will slide down the plateau with increasing counts, and, as ikerrg already alluded to, the efficiency will decrease and its impact may be more relevant for correction than the dead time. In a situation like this, when so little is known about a device, one should refrain from making any poorly understood corrections! GQ, we are interested in your comments and explanations. I suppose that a simple workaround is to increase the anode resistor (it is 4.7 MOhm in the RadMon kit and "only" 3 MOhm in the GQ counters). By doing this, you are limiting the current drawn form the HV circuit, and reducing the sag produced on each event. However, there must be a top limit for that, when the current that flows in a conduction event through the tube is so small that it cannot be detected (or sustain the avalanche inside). This needs much more time to do research and proper Spice simulations of the circuit. Again, could you comment of this, GQ? @ikerrg - I looked at your spec sheet for the M4011. The start V is simply described as <350V. That could be 100V or 349V. The graph looks to be hand drawn, and with the exception of the plateau area/shape it may not be showing the actual falloff with lower voltage based on any data. Instead of 10% range of the plateau, the falloff might be 15% and not the large drop shown. The youtube video of the 50k+ counts is compelling evidence that the counter can deliver those counts, but there is very little there to quantify state of the device and even if this is a plus 500 or simply a 500. Note also that GQ states for both a 500 and 500+ that a 5uCi source gives 26500 CPM. Does that give us any indication of slope fall off? Certainly more than twice the counts of the bottom ullix calculates, and half those seen in the video. 1 uCi = 37000 Bq (i.e. disintegrations per second). So 5uCi= 185k disintegrations/s. It depends on the geometry of the setup and the efficiency of the GM tube that all those disintegrations can be detected (obviously not). So I suppose there should be a mathematical way to estimate the count rate using the tube�s geometry, etc, especially if those disintegrations generate beta radiation, but I think it would be very complicated. No idea. GQ, we would like to hear your opinion about these findings and the contradictory data. As I know the GMC-500+ used very similar HV circuit, except it is adjustable voltage and ~3.7Khz square wave . I have M4011 datasheet is a little difference with your have. Since the Tube can work at 470V. So the tube voltage can be increased to 450V for testing. Thanks for the information, ZLM. So is the R14 a variable resistor that we can tweak to change the HV setting? About the M4011 data, I do not know if the voltages are OK or not, but in the table that you showed the length of the M4011 is clearly wrong! 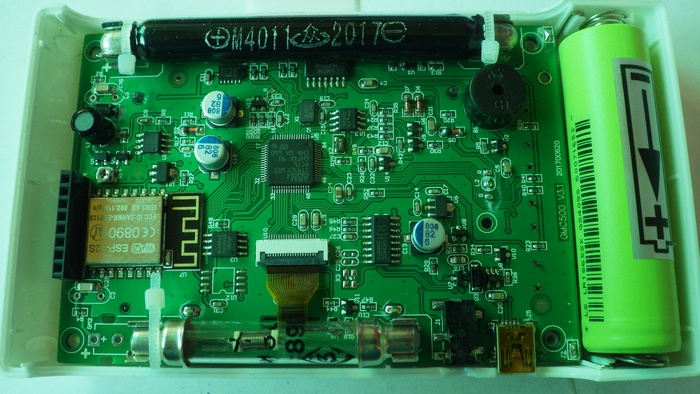 That information looks like it is for the SBM-20 russian tube! Indeed, this is not the M4011 spec sheet. I get 87.5...89 mm length instead of 107mm, and 10.0mm diameter, including the black-coated M4011, instead of 11mm. Furthermore, the 330V working voltage is also not supported by data, as I will show later. Just for the record: the RadMon+ HV supply is also easily adjustable, which is why I used it for some voltage effect measurements. It is done with a 2.5kHz rectangle signal with varying duty cycles, as the circuit diagram says. Re your diagram, can you tell what signal is fed into R9? Can this be used to switch off the HV power? And what is the meaning of - what I read as - "103" for the C2 capacitor? That is the only one to smooth the HV. 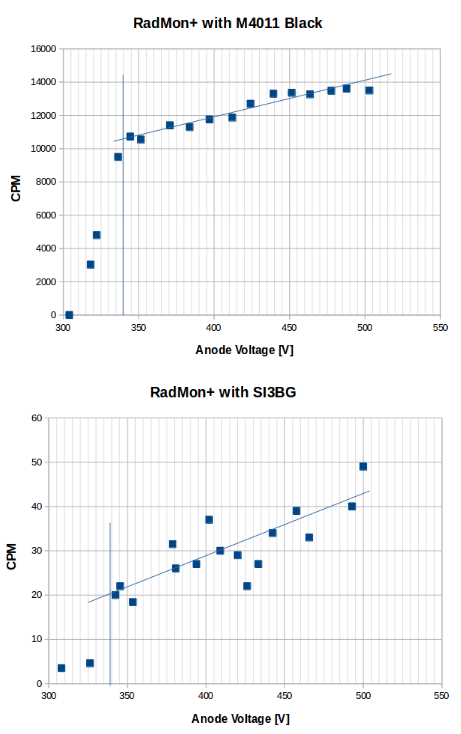 The inductance is only 10mH as opposed to 15mH in the RadMon+. This could well be the reason for the poorer power of the GMC counter. This is annoying! It seems that everywhere we look at there is a big mess under the carpet. I hope you guys (GQ) please start working on this asap, because nothing makes sense right now. You are not even using the right specs for the M4011 tube! If ullix was not there to thoroughly test and question everything, all this would have gone unnoticed, and that is quite embarrasing for a company that charges 135 EUR for a device that supposedly works according to some defined specifications! Looking at the "Detect Range", I find this also more than odd. With M4011 being able to see only betas and gammas we can set the biological weighting factor to 1, and the upper end range of 1E4 �Gy/min becomes 1E4 �Sv/min, equal to 6*1E5 �Sv/h. Divide this by the calibration factor of 0.0065�Sv/h/CPM, and you get CPM=92.3 Million, or CPS=1.54 Million. This means 0.65�s per count! Well, the pulse width for 1 count is 200�s, 300 times longer than what would be required to support such a count rate. Likewise, the lower end is 0.2�Gy/min, becoming 12 �Sv/h, or CPM=1846. Really? You can't detect anything that isn't at least CPM=1846???? That detect range is nonsense. Is it possible that this somebody didn't understand the difference between micro and nano? Who has authored and/or released this supposed M4011 spec sheet, which is wrong at at least 5 positions? I used the RadMon+, because it is so easy to adjust the anode voltage, and measured counts versus anode voltage for the two tubes M4011BLK and SI3BG. The radioactive source was gas mantles, which I brought as close to the tubes as I could, almost wrapped them around. So this is an "almost-beta-only" source. First, note that the M4011 yields 10000 cpm, where the SI3BG only gets 20, a 500fold difference. We had seen this before as a factor of 477 with ikerrg's uranium glaze pottery. So, consistent result. But this means that the SI3BG is relatively more sensitive to gamma than to beta. I have drawn the vertical lines for both tubes at 330V. This is at the edge of where the count collapse occurs. I find it impossible to define this at the lower end of the working range. Every serious manufacturer would add some margin, e.g. 30V, which gets you to 360V; the point where GQ's HV allows only some slightly more than 10000CPM. At 360V minimum I think both tubes will work. I did not risk going much beyond 500V, but the upper end of 480V stated on some tube specs is included. 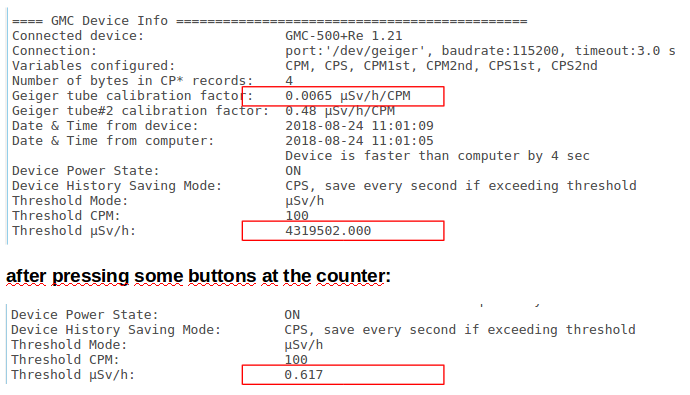 So, even if the GMC counter with a M4011 could support CPM=60000 - which it can't -, and exhaust the whole voltage working range, it would detect only 60000*79% = 47400CPM relative to what is should detect in reference to background detection levels, because of the slope of the working voltage "plateau"! Anyone still caring about dead time correction? We don't know what the display should have been showing. Perhaps e.g. 90000 or even e.g. 230000 or even greater. When measuring near the edge, I also found some counts being exact zero, others 5000, when they should have been 10000. Thanks ullix, that is a very exhaustive analysis, and as you say, easy to do with the right tools (a RadMon, a DMM and a 1GOhm resistor) and the right understanding! If the hardware is not driving the tubes properly, it is not only the dead time correction what does not matter, but also any firmware discussion that we have had previously and any possible fix (e.g. the combination algorithm) is pointless. So there is no need to keep pointing at the dead time correction, because we also talked about other corrections that have now become pointless. -First of all, the characteristics of the tube(s) must be known or extracted using a scientific process like ullix did. That includes obtaining the �plateau� shape and limits for different radiation levels. Here only the CPM matters, not the radiation type, so any strong beta source would be ideal as most of the tubes are more sensitive (apart from SI-3BG). -Then the effect on the HV generator voltage has to be assessed again for different count rates. Ideally, the HV generator should be modified to reduce the dependency on the CPM measured, but that would probably require a hardware fix (recall?). If the HV drops below some level, the tube response is so steep that no reading is reliable. -Finally, the effect of the tube response time (dead counts) can be measured/estimated at high count rates (or a sensible 200 us time can be used) and then compared to the desired accuracy to take a decision whether to include it or not. And with all that information, it might be possible to create a combined correction graph for each tube in a specific HV circuit depending on the count rate being measured. If the mathematical fitting functions are obtained, it might be possible to use different formulas to do the correction, instead of the very limited N point system! Obviously, if two tubes are connected in parallel, all this becomes extremely complex due to the linked effect on the single HV circuit. All this looks complicated for consumer devices like the GQ counters, but only if the HV circuit was more stable/powerful (and not single for dual tubed devices), the previous corrections would be enormously simplified, and just knowing the working voltage in the linear �plateau� would return a great correction for the measured CPM in every specific GM tube. And just to make things clear: This is not related to the uSv/h conversion at all! It has nothing to do with it. It is only related to the counts measured vs. the actual counts that there should be if the tube+HV circuit was behaving linearly and properly. No CPM to uSv/h calibration factor makes sense if these problems are not addressed before! 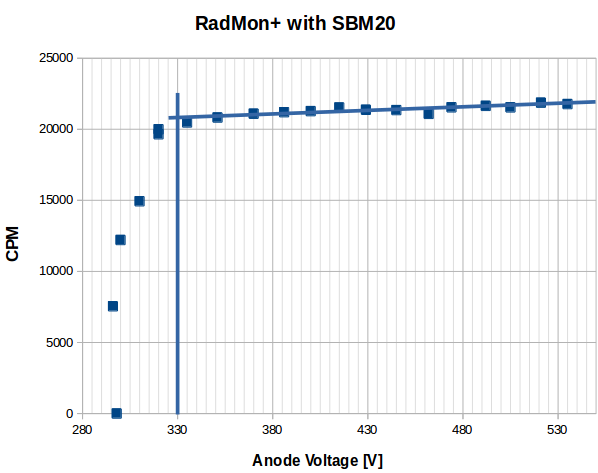 just for completeness, here the voltage working range for the SBM20 done again on the RadMon+; worth an hour of work. Finally something worth calling a plateau! Defining a cutoff of 330V is acceptable, but barely so. I'd add another 20V for a minimum of 350V. Upper end of 480V seems ok. The slope decline from High (480V) to low (350V) is about 5%; quite reasonable. Thanks for the analysis ullix, and the discussion on possible solutions ikerrg. To get anywhere with the GQ device we need to find R14. It is the tiny adjustable pot at the far left of the board in the first picture of this thread. It is a little more than half way up from the bottom of the board between the chip and the electrolytic cap at the left edge. Looks like a flatish Phillips screwdriver needed to adjust. I likely will acquire the 1Gohm resister at this point and work at improving the voltage to the top of the plateau. From the M4011 specs that ullix posted above the drop in counts versus voltage in the plateau region is .125% per V. Taking the GQ HV supply up to 500V (if it will go that high) and dropping it down to 330V is 170V across a pretty good plateau region on ullix's graph. 170 * .125 = 21.25%. Ullix's measured 21% drop fits the posted slope in the specs exactly. (You shouldn't be surprised ;-). I think the claims made for counts possible with this meter need to be confined to the plateau region. And a major flaw I see in ullix analysis is the CPM comes from the activity of the source he is using. The gas mantles only put out so much radiation. With a much stronger source the counts would be much higher and the slope likely the same (irregardless of power supply). So if we're limited by pulse length of 200 usec, the max counts per second before deadtime comes into play would be 5000 CPS or 300,000 CPM. But we know from ullix's work above that since we now can raise the voltage of the HV supply in the GQ meter that the working range limits must certainly be higher than the 11,200 CPM he indicates. We really need to see the graph created in Reply #17 above redone with the voltage in the GQ meter starting at the 480V top of the plateau. And since the tube specs show a max voltage of 600V may be applied, I'd probably see what we can get with pot cranked all the way to the stop and leave it there because if it's 500V, that seems to be a reasonable number given the line indicating the plateau on ullix's graph for tube response. Probably something wrong with my logic, but I feel like we actually are getting close to a viable working range number for the M4011 tube in this meter and once we know that the overall value of the device will be know for at least that tube. And we also are getting close to the value of the added SI-3BG tube not only for beta but gamma. I think it foolish to tie them together, and I am now of the opinion that we need to run one tube only in the device at a time, certainly the case if in a high radiation environment, physically remove the M4011. If not, the presence of the less sensitive tube probably won't detract meaningfully from the counts of the M4011. Oh, and the slope of the plateau for the SI-3BG tube that I posted in Post #2 I think of the radiative plate thread is .25%/v. So twice that of the M4011 plateau and again fits ullix's data quite nicely given the noisier tube: 170 * .25 = 42.5% change versus 46% drop ullix measured. Yes and no. The slope should not change, but a much stronger source will hit the cliff of the plateau much earlier, because you have to combine the effect of the reply #17 (voltage reduction at higher CPM) with the effect of reply #31 (tube response at different voltages). To avoid that, you need to be able to stabilize the voltage in the tube for any CPM. So you are assuming that R14 is going to give you all the juice you need! I hope you are right, but I think you are going to be disappointed when you start tweaking that resistor. In any case, it is a bit sad that GQ has not already gone through this process of simple calibration of the HV circuit for the needs of the installed tube. As ullix said, measuring more than 50000CPM does not mean anything, because the actual counts could have been 10 times that if the tube was properly powered. I am starting to love the RadMon+! All the info that ullix is showing about it seems to confirm that the design is very well done. I only see one problem: the look can be very tacky (and therefore suspicious), and I might not be able to travel with it in a plane cabin (and I almost never do the check-in of my luggage). Am I reading the schematic correctly when I say that to increase HV voltage we want to turn this pot counter clockwise to increase the resistance to ground and increase the voltage the transister sees at input? Yes, I know that both graphs are entwined in the response. 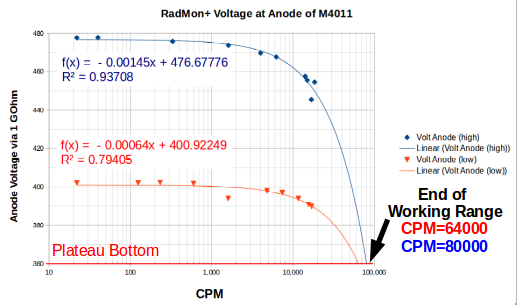 I just think we are not on the same playing field when we are characterizing the M4011 response in the GQ meter while doing so with the Radmon HV power supply. By cranking of the HV to the max in the GQ meter and then redoing the distance measures of the thorium mantles I think we will get a final solution for what those count levels might be for this meter to stay on the plateau. And I think that even with a non-linear response when voltage higher and lower than plateau there still is some useful information. The other comment I would make regarding the overall utility of this meter (and all of GQ meters of similar design) is that you both as users are probably in top 1-2% of users with regards to technical expectation. I have strong interest in background radiation and especially alpha from radon gas. I have a purpose built meter for that. I expect given the US map display GQ provides that many, many other users are getting good value in seeing their background responses posted along with other GQ users on the map. I think that for many, playing with mantles and ore samples and even radioactive glazed plates meets a traditional educational need that the meter performs quite nicely. If however you're doing high level laboratory data collection and analysis, or in the field where high levels in some areas are dangerous or lethal, are you really going to trust your health or results to a $125USD meter? Seriously? As the_mike said, in those situations it's worth it to spend (much) more or leave it to NC personnel. As a consumer product, GQ has built some very nice stuff. My expectations as both someone interested in those items above, and as someone interested in the all hazards emergency response side of things are being met and reinforced by all the work that you both have put so much time in. GQ has demonstrated the commitment to improving our understanding of the meter's response again and again in the short time I'm owned my meter. You can criticize the lack of testing, and the characterization of the capabilities, but I think that those inconsistencies are based more on the individual components and not the sum of the whole (which honestly they should be based on). I think in general that I got what a paid for and paid a lot less than for other meters that have a whole new set of issues that would need to be understood. I like the Apostle Paul's comment regarding Church doctrine = (roughly paraphrased) Test everything, keep the good, toss the bad. There is a lot of good here for the money. I remain impressed with GQ's involvement, and I do not fault them overly much for not wringing these meter's actual capabilities out. I am confident that they are relying on the design engineers claims that may not even be more than subcontractors in the overall scheme of things. As I said, I think we're very close to a confident assessment of the limitations of the 500+. I have learned a great deal and thank you both, no matter what the further response of GQ. Truly, really fun stuff. @Stargazer 40: I mostly agree with what you say, although blaming contractors should never be an excuse for a poor job. In any case, I feel slightly cheated by the specifications, because the good value for the money (and better agreement to the specs in http://www.gqelectronicsllc.com/support/GMC_Selection_Guide.htm) goes to the GMC-3XX models. Clearly the GMC-500 series is over-specified and overpriced, and you get nothing but a poorer accuracy on the high sensitivity tube, a poorer calibration capability and an unknown response on the low sensitivity tube. And after the last findings, it even requires physically removing the high sensitivity tube if you plan to do high radiation measurements at any time. For me that is not fair, because they should know the limits of their devices and advertise them as corresponding. If the purpose of consumer products is just measuring background or play with uranium plates, the dual tube device is a nonsense and a way to cheat more advanced people to buy something that is not going to fulfill the advertised specs. That being said, personally I enjoy the process of testing and researching, and I am learning with ullix�s and my own experiments in the process. If that is worth the extra 20 EUR of the GMC-500+ vs. the GMC-320+, maybe, but not many people will be so keen to pay for something just to enjoy debugging and tuning the system for a private company that is making money with it. The pity is that, just by reading the RadMon+ manual, GQ could have understood and found most of these issues, and now we should be talking about how to improve the firmware to get the most of the device, not about how to fix the hardware in something so basic as providing the right electrical feeding to the key component (the GM tube). All you say I do agree with, except the other saying that goes without saying is 'Buyer Beware'. I have to say the numbers in the specs sounded good, but really, given the degree to which they are off in actual use, how can you guys not have known something was amiss with them? I did enough research to see that this was a bargain for what I paid. I think it is more of a bargain now. And I don't consider this meter a toy. I consider it a device in which I am gaining more confidence with each bit of analysis presented. I am comparing to meters much more expensive without a second level of data collection capability built in. And now I can determine which to use. (Your extra 20EUR buys you that. Not a bad add for the money when the tube alone is 10EUR all by itself.) You praise the Radmon, but it is a kit that isn't cased and has a lot of flexibility, but is what you make out of it. Same here. Find the limitations of the 500+ (which is what you and ullix are doing) and what it does well and make use of those. I likely will get some 600V coax cable and solder to clips with small hole in side of case and add clips to use with different tubes on that least sensitive side of the meter. Will fashion a wand or add small case to eliminate risk of high voltage in use. Would really like to add a pancake wand but need to watch line losses. And finally certainly interested in higher HV testing with mantles and, of course, I'm interested in GQ's response to these data. A couple of comments on my selection process. A good friend acquired a Mazar 9000 meter because it was capable of alpha detection if a couple of passes were made to isolate. It's range is 0.1 to 1250 uSv/h. A very good meter, but not as high specs as 500+ (0-4250 uSv/h for M4011 and 0-42500 uSv/h for SI-3BG). $572.60 USD on Amazon. The Radex RD1212-BT was the other I was comparing. It has Bluetooth and not Wifi. Also a phone app for data logging. It uses an SBM-20-1 tube. It's range is .05-999 uSv/h. Cost is $234 USD. This is used by an former govt nuclear waste/incident manager as his personal pocket meter and supplemented with a Ludlum 3 Survey meter with pancake wand. The Ludlum is $500 plus in the used market. The 500+ covers the ground of all three of the above and we are learning the actual ranges it is valid for through some serious analysis by ullix and testing by ikerrg. I think it is the most capable meter and the best value that GQ sells. To beat the range for the Mazar 9000 we need to be able to receive from the M4011 1250/.0065=192,300 CPM. I think we know at this point it will not be likely. But if those higher levels are encountered and we use the SI-3BG tube stand alone, 1250/(.0065*70)= 1250/.455= 2750 CPM for gamma and 1250/3.25= 385 CPM for beta may very well be possible, although the HV may not allow either of those count levels. Again we need to adjust the voltage to the max and redo the distance measures of Post #17. GQ's 320 V5 is rated 328 uSv/h. 328/.0065 is 50461 CPM and that is already a reality with the video showing CPMs that high, likely with the M4011. Still, it may be out of the plateau region at that point so maybe not an accurate measure. It may be when all is said and done that the 500+ on the sensitive tube will match the 320 and if much the same in hardware, would be expected. As well the Radex meter may be more capable (if it also doesn't have HV issues) from a value standpoint, but wouldn't trust it out of the box to be able to meet its specs either. I guess I would like to know what was changed between the 3XX meters and the 500/600 meters to get to the max for sensitive tube 4250 uSv/h levels we see on the geiger selection table compared to the 328 uSv/h shown for the 320. I think I read somewhere that the new meters have a 32 bit CPU, so they can count bigger numbers with the same tube. Please, keep us informed when you try to increase the voltage in the HV circuit. Okay, now I think we are getting somewhere with regard to expectations. How can you advertise numbers of range more than 10 times the GMC-320 in the GMC-500/600. You increase data storage precision from 2 bytes to 4 bytes. I think we have to think a little differently about how GQ might be looking at these counters. They have a sticky in the forum on custom tube usage. In some ways they are providing you a dosimeter with a couple tubes and some decent firmware and an adequate power supply. But changing the storage by doubling the bytes allows for adapting different tubes that can make use of the HV and counting mechanisms of the 500+ and maybe make use of the extra precision and they can market based on a 4250 uSv/h range provided by the storage capacity. The counter as you buy it won't be able to get there, but it may provide a vehicle for you to adapt additional hardware to make more use of the counter increase in precision. Kinda like the DIY Radmon. What really is needed is a regulated HV power supply that adjusts to the count rate to keep the tube within the working voltage range. These power supply circuits do not provide for that. If GQ could build that kind of power supply into a meter and give a little more thought to two more closely match tubes we might get a two stage meter that fits a lot better all the things we envisioned with the 500+. When I get my 1Gohm resistors I'll let you all know how the voltage increase works. I do wish that ullix would make these adjustments with his provided meter as he has no investment in keeping it under warranty, and he can keep the data graphing consistent with starting voltage for measurement up near 500V. with the GMC-500+ being powered off and unconnected, I plug in the USB cord. While the device seemingly remains off, and the power switch has not been touched, the tube does get power, some 360+ Volts. Could be an unpleasant surprise when you come into contact with the anode, expecting it to be free of any harmful voltage. What is a power switch for, if not to switch power? Could there not be some charge in the system remaining in the HV caps? Does it appear fixed or does it dissipate. ? I think the USB cable connection actually powers on the device to be able to charge it. You even have access to the serial port with the device in that state (OFF but connected to the USB). I think it is related to what I asked in http://www.gqelectronicsllc.com/forum/topic.asp?TOPIC_ID=5304 Reply#78 and EmfDev answered in Reply#80 (second paragraph). It is actually a good thing that you can have access to the serial port with the device in OFF state, because it allows you to reset it or re-update in case of a failure in the firmware update process. But the HV circuit should stay OFF! I have actually seen a weirder behaviour after updating the firmware with the device OFF (i.e. device off - connect usb - update firmware). When the firmware update finishes, the device resets and stays off (charging), but the speaker starts noticing radiation events in the tubes! @Stargazer: you are overestimating the charge this HV-gen can hold. This "103" at capacitor C2 in ZLM's circuit probably stands for 10*10E3pF = 10nF. The same value is used at the RadMon+ design, here actually for 2 capacitors C5 and C6, so 10nF are likely also used at the GMC-500+, albeit only 1 instead of 2. Should only effect the ripple on the HV, not the overall power of the HV-gen. The RadMon+ works this way: I set it to collect CPM for 60 sec, then it shuts down the HV to save power(! ), then collects the temp, press, hum data from the BOSCH sensor, then sends all data via WLAN to an MQTT server (located in California). After all this, which takes about 7 sec, the HV is restarted. This shutdown helps in power saving to allow running the RadMon+ on batteries when using as an outdoor monitoring system. This picture shows the falling edge of HV after CPM is completed, and the rising edge for the next round of CPM. The latter takes less than 0.1sec for full HV. The signal is measured via 1GOhm to a 10MOhm osciloscop, and it falls to almost zero after the 7 sec. With the HV gen having an internal resistance of 16.12MOhm, a true shortcut at 400V would result in a current of 25�A. That is 100 to 1000fold less of what it takes to do electric shock harm to a human being. So, I became adventurous and touched the anode with a finger. Nothing. Used two fingers of one hand on anode and cathode. Nothing. Tried the more powerful RadMon+: nothing. Still, while the electric shock part may not be of concern, the tube is powered upon connection although the counter pretends it is not (while allowing full interaction with GeigerLog). But when the tube has HV, it counts, and thus, is using up its lifetime count budget when all you want to do is charging its battery. What is wrong with the concept of "OFF" really being "OFF"? I did match the response of the CDV-700 meter to that of the GMC-500+, by the way. I didn't use the Cesium spot on the case because it would have read on the low end of the scale where things aren't accurate at all. Instead I used my stack of Th gas mantles and both meters were reading the same 3.25 mR/h when I got done. That's right at 5000CPM for the 500+ and 2000CPM for the CDV-700. I will need to check the specs, but that makes the conversion factor for the 6993 tube .01625. Here: BYTE1 is the integer part of the temperature. BYTE2 is the decimal part of the temperature. BYTE3 is the negative signe if it is not 0. If this byte is 0, the then current temperture is greater than 0, otherwise the temperature is below 0. The 38 (�C) is way too high, even for a sensor sitting on the board, the 12 is an illegal value within your definition, the 00 may signal a positive temperature, and the 170 is end-of-message. It is also not an ASCII format text. What is the new coding in the 500+? What else has been changed and is now different from what is stated in your document? is greatly affected by its temperature(or this temperature is actually for the processor) and is inaccurate. We just forgot to remove it from the documentation. try to improve the hardware, including reducing the voltage drop at high cpm. For testing, you can try to increase the high voltage by twisting a potentiometer near the WiFi/ESP8266 module to see if it helps. Remember that the guy from the video was still able to generate 50k CPM under 1 minute with the current hardware. Thanks for looking into it. I would appreciate if you could release any hardware modification that you might decide to implement, so we can improve that in our flawed devices if it is a simple fix (like increasing the cathode resistor). For what we know so far, the 50k CPM reading could have a massive error (>100%). I do not consider fair having to stick to devices that are not working as expected. @EmfDev: measuring the CPU temperature does have its value, though marketing it as temperature sensor for the environment surely does not! Now after declaring it as not valid, the proper procedure in the firmware would have been to return a defined dummy value, such as e.g. done in the 300E+ as b'\x00\x00\x00\xaa'. Instead you return something undefined that sometimes looks right and sometimes not. I will now remove it completely from GeigerLog. @ikerrg: you said cathode resistor but may have wanted to say anode resistor? The GMC devices are cathode sensing (the RadMon+ is too) so there are cathode resistors (RadMon+: about 100kOhm), though I can't see why changing them would possibly make a difference. I don't even see how changing the anode resistor could make a difference. We have the internal resistance of the HV of 16.12MOhm. The anode resistor is 3M in series with it, which would reduce the current by some 15%. So what? My guess is that this anode resistor is a remnant of the old Geiger counters, like Stargazer's flat iron type counter with perhaps lethal high voltage. 'Lethal' here would mean its internal resistance is much lower, perhaps (well) below 1M? In this case it is important having an anode resistor that would limit the current flow through the tube, which otherwise might have turned the tube into a light bulb due to a non-extinguishing discharge in the tube? Sorry, my bad! Yes, I meant anode. No idea of the quantitative effect of a higher resistance. I suppose that it needs to be confirmed by GQ using their testing units. I think that the avalanche effect of the electrons inside the tube might not be linear with the impedance of the circuit, and therefore the change of the resistance in series might extinguish the current much quicker than expected, reducing the load on the HV circuit. But it is only an speculation, I don't really know! More weirdness, this time on the threshold. Pressing the buttons while in the counter's threshold menu I notices ridiculous results of "�Sv" of some 4.3 million, and it could even be downloaded by GeigerLog, see picture. And that while CPM stayed at 100. After some more button pressing this went away and a more reasonable 0.617 showed. Please explain, when the calibration factor is 0.0065 �Sv/h/CPM, and the CPM value is 100, why is that calculated to be a "�Sv" mode value of 0.617? Shouldn't it be 0.65 straight? And last, but not least: the units are �Sv PER HOUR and mR per hour. It is another level of sloppiness in not getting the units correctly, telling in big letters the lack of scientific understanding. Not enough weirdness with the 500+? Here is more, this time on the Real-Time-Clock (RTC). The old counters do not have a RTC; they use the CPU to keep the time, which does not go too well. Switch the counters on and off, or do other work, and the time flips forth - or back - by seconds, minutes, days, even decades! The 500+ does have a RTC (see picture: the 8-legged device north-east of the CPU with the marking DS1302Z, thanks to the_mike for identifying). And it is better, at least as long as it works, which is the catch. In the last few days I got many dozens (!!) of times the message at the counter "Please set date & time". Well, setting isn't possible: stepping through the date/time-setting menu shows you all zeros for year month day hour minute second, but not one can be changed! Rebooting does not help. Factoryreset does not help. Attempting to set the datetime via GeigerLog does not work - ironically the counter returns the AA byte on the SETDATETIME command, but the datetime is not set. The only thing that helps is slamming the lower-right corner of the counter (where the battery minus is) on the desk. I guess a loose connection somewhere, aka bad soldering. How is that for hitech? P.S. such sudden losses of DateTime also occur in long runs, like overnight. As 2000-00-00 00:00:00 is not a valid date, GeigerLog translates this into '2099-09-09 09:09:09'. When you see such a date&time in GeigerLog you know it came from a bug in the counter! In the last few days I got many dozens (!!) of times the message at the counter "Please set date & time". I have never seen that problem in my device. Yours is probably a defective unit as you might have already found. shortly before 19:11h I got the device working. Then I'd left the device alone, expecting a night of measurements. Only some 20min later the 500+ failed again, and remained in failed state until this morning. With some gentle slamming I got it back to work; but only for a few minutes. Any idea how this can be fixed? Any places for re-soldering? So it's my guess, that the RCC doesn't get constant power for running for a reason. Thus the need of resetting Date&Time all the time... Add a little "Firmware not so ready for the RTC" and you have an explenation for this behaviour i think? The RTC itself does not seem to be the problem, because when the time comes back, the time is correct (within 1...3 sec) even when the outage lasted for hours, so the RTC has continued to run. Somehow it is either the soldered connection of the RTC to the system/CPU, or some issue in the firmware. So, the GMC-500+ as your own little Do-it-Yourself project, just like the RadMon+? Do you realize that all the 'related' components are SMD parts, and they are really, really tiny? Maybe I should start the resoldering at the High-Voltage generator, because this is where the 500+ is really lacking. The RadMon+ show how easy it is to make it better. I had tried to determine the max count rate supported by the GMC-500+ and came to a disturbing limit of marginally above CPM=10000, see Reply#17 of this thread. As I have no more powerful radioactive sources, I took a different approach. Both tubes were removed and the M4011BLK holder connected to a resistor cascade. The anode voltage was measured via 1GOhm resistor, the current calculated from the known resistance. Same setup used for the RadMon+. The no-load anode voltage was set to either 400V or 500V. Overall all 4 curves are similar. With increasing current the voltage drops, as is to be expected. Clear to see, the RadMon+ has almost twice the power of the GMC-500+! 350V is the bottom limit for the M4011 to still deliver counts, i.e. the left limit of the plateau, shown as a dotted green line. At this level the 500+ (red curve) delivers ~5�A, while the RadMon+ almost twice as much. Similar, at 400V, the 500+ is limited to ~1.5�A, the RadMon+ to ~3�A. As the current through the tube is proportional to the count rate (below saturation), it becomes clear that both systems will have a maximum count rate they can support, because the voltage must stay above 350V. The question then becomes: what is this limit? The design of the GMC-500+ limits it to a max count rate of the M4011 tube of CPM near (and probably below) 60000! It does not help to have a second, less sensitive tube installed, because both hang on the same high voltage generator, and the voltage has collapsed too far for either tube to give a count! Given the GMC-500+ specs of a maximum of 42500�Sv/h means the M4011 at a calibration factor of 0.0065�Sv/h/CPM would be hit by CPM=6.5million. That'd be a current of >600�A. Utterly impossible. Exactly what has to be expected. Thanks again for that extremely good analysis, ullix. All that confirms again the problem in the GQ counters and now we really need some official answers from GQ on how to proceed (if there is a possible hardware fix, etc.). It is clear that the only workaround is to accept that the GQ products with a M4011 tube are limited to around 50k CPM and, specifically for the GQ-500+, that the only way to use the second tube is by physically removing the M4011 (maybe with an externally accessible switch?). The GMC-500+ high radiation range is completely useless as it is sold! To be clear, the problem of the HV network does not only apply to the GMC-500+, but probably also to other GQ single tubed devices, as ullix also demonstrated in the GMC-300E+. However, in the specs (http://www.gqelectronicsllc.com/support/GMC_Selection_Guide.htm ) the limit for the GMC-3XX is 328 uSv/h, i.e. 50k CPM, which is according to ullix�s limit. Is it possible that somebody designed the GMC-3XX with that limit in mind? Is it possible that the hardware limit was forgotten some time later when GQ decided to create new products with a 32 bit processor? Please GQ, we need your answers and fixes! Initially the "calibration factor" for the M4011 tubes was defined as 0.005 �Sv/h/CPM. You find this mentioned in some old forum posts. Multiply the max 16 bit number of 65535 with 0.005 and you get 327.675. By whatever magic they ended with 327.99 remains another mystery. Neither this 0.005 nor the 0.0065 value is supported anywhere with data. Thanks for all the work ullix! I take it you have made use of the pot to increase the voltage of the 500+ PS for your tests. I would ask how sensitive it was to small adjustments of the pot? Still waiting for my 1Gohm resistor. I think as stated previously we are looking at the published specs characterizing the capability of the new 32 bit processor and not the capability of the gm hardware. 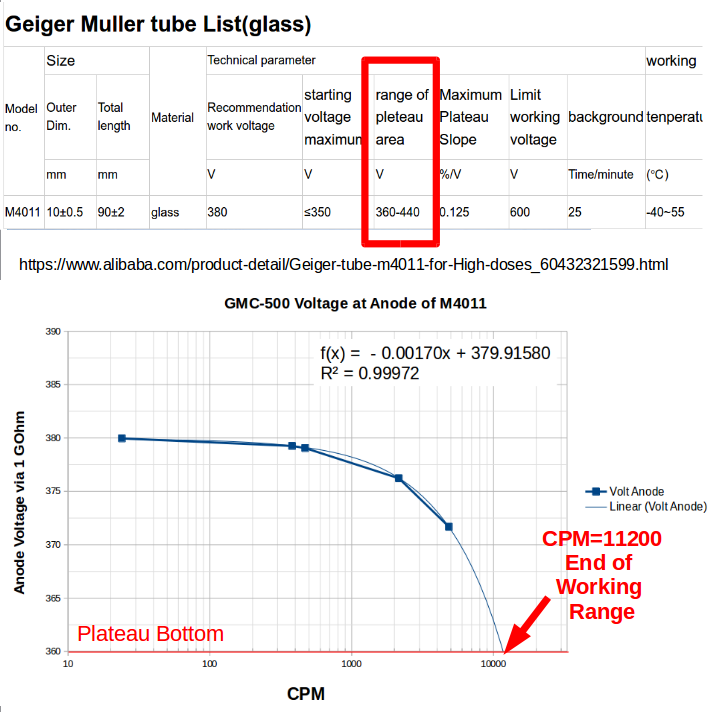 If there was a tube that would be able to stay in the plateau voltage range while receiving millions of CPM, the new counting hardware could handle it. I do not believe there will be an adequate hardware fix (or firmware for that matter) for this device anymore than we will be able to adequately make use of the second less sensitive tube without physically removing the M4011 tube from the current hardware configuration. That said, I, like the majority of users no doubt, am quite pleased with what I can do with the device as to background counts, and that there is utility in the event of an incident occurrence. I truly believe that you both have made your point ad nauseum regarding the true capabilities of this GM dosimeter and have reached a point where you need to move on to replacement (possible refund in ikerrg's case) and seek a meter with capabilities that meet your obviously much greater count accuracy needs. That the Radmon+ can handle only a factor of two more counts than the 500+ shows me that very likely all these inexpensive meters have high voltage PS limitations that would make them less useful at true incident monitoring levels, which we don't care to be around evaluating anyway. I have discussed the PS issue with tech support. I for one think that some form of regulated, constant voltage PS needs to be incorporated into a new meter along with the higher ranged counter that will hold voltage in the plateau range no matter what current is flowing, and that will cut supply voltage to most sensitive tube when counts exceed some number so that only least sensitive tube is powered. I think the cost of such a PS would greatly add to the cost of the meter, perhaps by many hundreds of percent. Not sure about the market for something like that, but perhaps development of such a device by GQ would take them to a new level of performance whereby the count capability of the processor is better matched by the hardware, much as the hardware and firmware handling of the second less sensitive tube (and indeed the selection of the tube itself) needs to be redesigned. I very much appreciate this forum. I think we have been made aware of issues that likely affect all these inexpensive meters and not simply those manufactured by GQ. You always refer to the reduced cost of this device compared to its competitors. Again, that is not a fair excuse. If you buy a Volkswagen Polo instead or a Ferrari F40, both are cars, both can be used to commute to work, but the former is not advertised to have the characteristics (speed, acceleration, etc.) of the latter and it cannot be used to win a championship in a race track, and nobody expects that. Therefore, when you buy a Volkswagen Polo, you know that you can only travel at 130 mph max. and therefore you are not cheated with a speed range of 0 to 200 mph! You pay with real money, and you receive the real specs that you paid for! That is the only complaint I can make to GQ, because the GMC-500+ is clearly a nice device to start learning about radiation measurements and to play with at a limited cost. I think as stated previously we are looking at the published specs characterizing the capability of the new 32 bit processor and not the capability of the gm hardware. That has not been confirmed by GQ as far as I know, and in any case it should be clearly stated in their specs and in the comparison document, to stop cheating anybody with the huge reading range of the GMC-500+. We have already seen users in this forum not being able to use their GMC-500+ at high radiation levels (i.e. cancer therapy), and they were not involved in nuclear incidents! We have also seen that an Xray machine in an airport could be reaching those levels, and it seems that it cannot be accurately measured with the GMC-500+ unless you remove the first tube. Those are facts shown in this forum. Those users bought this device instead of the GMC-3XX because of its increased detection range. I do not believe there will be an adequate hardware fix (or firmware for that matter) for this device anymore than we will be able to adequately make use of the second less sensitive tube without physically removing the M4011 tube from the current hardware configuration. Well, GQ could explain themselves and say that the only way to use the second tube is by physically removing the first and they could propose a hardware switch (tested in their labs) to add in series to the first tube that does not disturbs the normal low radiation level readings. I truly believe that you both have made your point ad nauseum regarding the true capabilities of this GM dosimeter. I do not think that ullix is trying to be boring by testing and retesting the device. This is really useful information for GQ engineers (subcontractors?) and they should be answering these posts with useful data and information about their intentions and aims. Until now they are saying nothing about this problem! You have given more information only in the last post than what GQ have said since ullix started this thread! I think we have been made aware of issues that likely affect all these inexpensive meters and not simply those manufactured by GQ. Yes, but the big difference is that the other inexpensive meters are advertised with a correct reading range (like the GMC-3XX series). And in the case of the RadMon+ DIY open source project (=free), that limitation is even described in its design manual, so you can cope with it in the best way that your electronics knowledge allows you to! As I said, you do have options that include requesting a refund. It was naive of us all to not understand that the ten fold increase in measurement range and movement to 32 bit processor from 16 bit processor were related. GQ did confirm that the published range increase was due to processor count ability when I contacted tech support. As well, the tubes do not stop counting either at the top or bottom of plateau voltage. They simply no longer are linear response. So GQ can certainly say that counts are being recorded throughout the voltage range provided by the device, but really we know the tube will fail either from the voltage being too high or stop counting when voltage falls to a point where there is no longer an avalanche effect. The power supply limitation really is the most important thing I believe has been determined here (and is the Radmon+'s critical limitation also). I liked the idea of the ten fold increase. But I know better now. I like the idea of two tubes working together to characterize a broad range of response, but I know a lot more about the limitations of that now, and not only for this meter, but will question any manufacturer of similar capability with a lot more background as a result of yours and ullix's efforts here and you deserve our thanks for that. I do not want a refund, partly because that would involve additional shipping costs that I do not want to pay for. What I want is to use this device as a test bench to play and to learn. Time permitting, I want to add the switch to the first tube, I want to switch the second tube by a SMB-10 (I am still waiting for it to arrive) and now that I know about the HV limits I want to talk to some colleagues at work that might be able to help me to improve that. I will document all these mods as I go through them and share them in this forum. I would also like that GQ would give some advice to improve the hardware of the GMC-500+ devices, even if that involves admitting that they are flawed in their specs. I believe GQ is perfectly comfortable with their understanding of their specs. In the US we have a commercial products evaluation group known as Underwriters Laboratory. When we buy anything that plugs into the wall there normally is a label on the cord that says UL Approved. Doesn't mean the device will do anything we think it ought to; just means it won't likely short out when plugged in according to their testing (yes they do test things). GQ meters have been consistently ranked in the top ten of these types of dosimeters with high praise for features and build quality. I have often wondered how many of these rankings were more than label comparisons that anyone considering purchase with reasonable common sense would do. Ullix might consider a new service testing various meters for delivering what the label says or not. Of course there are likely far more stringent requirements for government measuring devices where these things take on a completely different level of seriousness. In any event, I believe your attitude towards what to do next is a good course. GQ remains one of the most open companies I have dealt with and I may have gotten a little more info in talking to tech support instead of trying to glean thing from forum discussions, but then those conversations are not indelibly recorded on the internet. Thanks to both of you for continuing your study of these devices. I will add more when I have more to add. I will add more when I have more to add. I bought this HV probe for use with an oscilloscope. It says X100 for 10Mohm input. Someone had written on it 10Mohm VTVM DC Only. Never gave it much thought till my latest offer for a 1Gohm resistor from China was not accepted. Dug this out and took apart and found a Beamen 990 Mohm 1% resistor. Now I can adjust the voltage on my 500+. Stargazer 40, thank you for sharing pictures. It is a good probe to measure the high voltage. Just for you information. I ever tested GMC-500+ with a LND7317 tube only with tube voltage about ~500V. I do not have high voltage probe, I use my 10M ohm DVM estimates. With a 5uCi Cs-137 radioactive source, the GMC-500+ got about 150000~160000 CPM reading. With M4011 ~380V, it was about ~12000CPM if I remembered correctly. 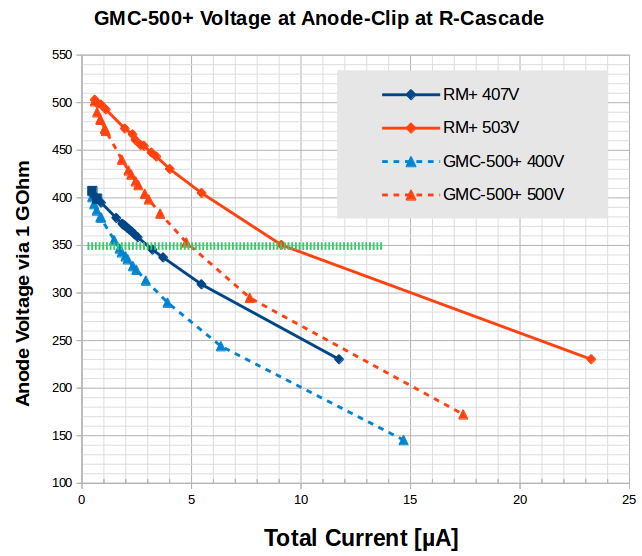 I believe with improved HV power supply circuit, the GMC-500+ can have a much better performance on CPM. @ZLM: With all due respect, but I don't believe these numbers! I've now heard too many of the 'dog ate homework' excuses from GQ, that I do want to see data. Prove them - that is all I am asking. Though, if you did get numbers like 150000 - which I believe is not possible on a current 500+, also not with this pancake detector, as it will draw a similar current - why would you want to improve the HV generator, if you are already getting these high numbers? It seems to be not supporting your claim. Since you do have a 5�Ci Cs-137 source, put it in front of a 500+, and record for a few hours, preferentially with GeigerLog, as it can handle both tubes, and post the recordings. I will analyze the data as I did with other user's data. Your chance to get a positive endorsement! GeigerLog will be out as the new version 0.9.08 before the beginning of your day, so it will be waiting for you! I can easily be convinced otherwise by just a few data! No problem, I will test it again once I go back from trip. I am in Frankfurt now. Nice weather here by the way. I have cs-137. Once I got chance,I will upload a video. However, everybody can test it too. The M4011 CPM is in the same range of your testing. But the LND7317 tube CPM is much higher. That indicates the LND7317 consumes much less current than M4011. That is why it costs 10 times higher. Different tubes have different gas filled. Those are affecting the resistance when it is conducting. Wonderful, looking forward to it! Measured the voltage of the 500+ this morning with and without the 1Gohm probe. 407VDC with probe and 146VDC without. This is just a tad higher than the midpoint of the working range/plateau. It seems to me that to get he maximum range possible within the plateau that the PS voltage should be set to 440VDC to maintain linearity (albeit with slope) in measurements. The SI3BG has a similar working range but a little higher on the top end by 20VDC. Maybe a good compromise would be to change to 450VDC, but I doubt that the SI3BG would ever strain the PS unless in the midst of an incident and the M4011 would be removed anyway so will shoot for 440VDC in my raising of the PS voltage. Today I adjusted the voltage of the PS to the top end of the plateau voltage (or as close as I could get) of 440VDC from specs above. Actual reading was 446VDC on the 1Gohm setup. As well I believe I need to raise the conversion factor in the calibration section to .00715, up 10% from the reading it gives at the 407 VDC I started from due to slope change. Voltage adjustment was quite sensitive, but rather easy to do. I think this gives me the best chance to get the 53,000 CPM ullix computes above from the M4011 tube at 355VDC. I think that is around 40mR/h or 379uSv/h. It's also where I cross over to the SI3BG tube and at 40mR/h I think I should see somewhere on the order of 150CPM with the power to the M4011 tube turned off or the tube removed. This exposure rate for one hour gives a dose of about a tenth of annual background dose. I guess you have one 0 too many in your new calibration factor? But it is pretty futile anyway, to "correct" this factor. Remember that it had been 0.005 when the 300 came to market, and with the very same tube it is now 0.0065. Which one is correct? If any. There has never been a description on how this number was obtained. My guess, as I describe in my GeigerLog manual, probably just the average of two values as determined for the SBM20 tube. There exist no data to justify the 0.0065! And while the SBM20 gives individual values for different radiation sources, and even your old clunker of a Geiger counter is careful to qualify its calibration for "radium-equivalent radiation". The 0.0065 may be right for something, but will be wrong for almost everything. Your correction may have made it worse. Nobody knows. Corrected conversion factor above. I can see that the counts for gas mantles are up 10% over what I was getting max before. So the slope certainly is real. Didn't actually change calibration. A 10% add to reading is easy to do in head. Spoke to the guy at Mazur yesterday about their PS. He said it was the most critical design problem they dealt with. They send representative samples of their meters to AKM Calibrations in North Carolina and show report on website. Range of meter is listed as .01uSv/h to 1250uSv/h. Calibration report shows error less than 10% for that range. GQ ought to consider a similar approach for whatever range they think is truly viable for their meters as to actual use and not for counter's ability to count to only. I got time to repeat my LND7317 tube testing on GMC-500+. The results are batter than I expected. Thank you ZLM for showing us the video. With 17,500 CPM for the M4011 tube we are looking at ~115uSv/h. On ullix's graph in Reply 17 above he got a projection of 11,200 counts at 360v, so his curve is sharper drop in voltage than your data point shows. This would change the upper limit of measurement with the voltage set at 440v, the upper end of the plateau. The 7317 shows itself to be more than six times more sensitive than the M4011. Six times is from what you show on website for 5uCi source. Yet here it is 11.5 times more sensitive. 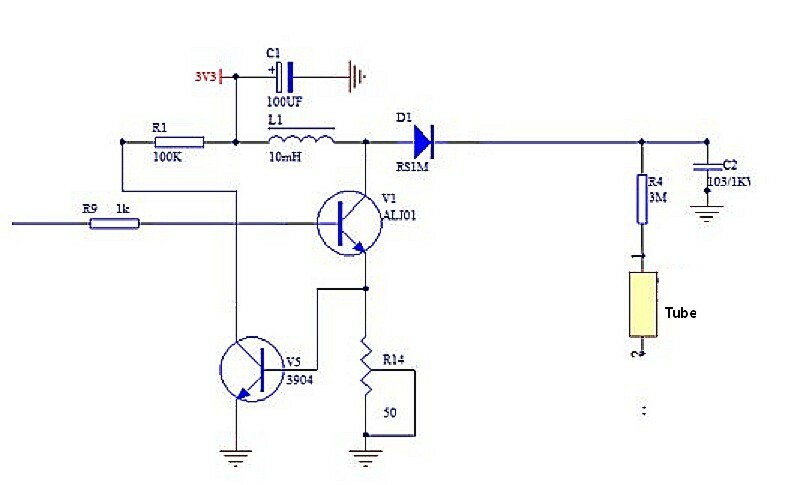 To achieve the 201,000 counts there is a 250v drop in PS voltage. 429 volts is just slightly above the starting voltage for the 7317, and it is out of the plateau range of 475-675 volts. Given any higher counts would likely drop the voltage below the starting voltage of 425v, wouldn't you agree that the limits of the 500+ with a 7317 probe would be about 125uSv/h. With the M4011, I think we really have a chance for those 53,000 CPM and around 380uSv/hr. I very much like the idea of an add-on kit for the 500+ whereby we could use the 7317 tube with the 500+ for more sensitive measurements of food and the like. Could you repeat this experiment with the M4011 tube removed and only the SI3BG tube collecting data so we could see the same experiment with what level of counts the 5uCi source gives us for that tube? Maybe we can get a better number for conversion factor. Thank you. For this particular tube, it showed a 449CPM ~87uSv/h on a 5uCi Cs-137 source. Thank you so much! 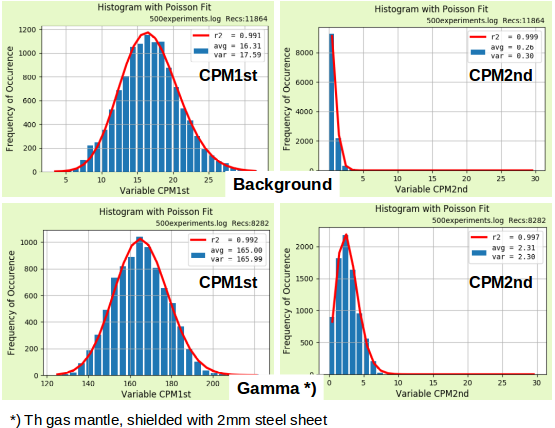 So 17,500 CPM for M4011 and 449 CPM for SI3BG means 39 times less sensitive. Quite a difference from ullix's sensitivity comparisons up in reply #31 for this Ce137 source compared to the gas mantles. So 39*.0065=.2528 conversion factor. I got .458 from the gas mantles experiment so maybe difference is the type of radiation? First, the high dose tube has higher deviation on low dose reading. It may only work well on high does reading. Second, Most of high dose tubes are designed to be more sensitive to Gamma ray. If I am not wrong, the gas mantles mainly for beta and alpha, Gamma ray in a small portion. The cs-137 has much more Gamma ray portion. That may be the reason and can be confirmed by checking the gas mantles radioactive decay chain if needed. Placed the testing source contacted the M4011 tube, the reading is 44922. Placed the testing source contacted the LND7317 tube, the reading is 205808. First of all, many thanks for the experiments, ZLM. That is really good stuff. Now we are talking the same language and we are watching real data! Before your reply #84, I was just going to say that the location of the cs-137 source was not the same for the M4011 and for the SI3BG, and hence the reduced ratio in sensitivities between both tubes. Now, the ratio 45000/450 = 100 is more similar to what ullix and I found in the different experiments for gamma radiation. And by the way, yes, the tubes behave very differently to beta and to gamma, and therefore the ratios are also different (around 475 for beta). And also yes, the high radiation tubes like the SI-3BG seem to be only specified for gamma in the original specs, which makes a lot of sense for an incident. I miss in the experiments what would happen in the reading of tube 2 when tube 1 is measuring 45000 CPM. To do that test you would need another identical cs-137 source to put near the SI-3BG tube, and you can use the �Large font� mode to see the CPM of both tubes. That experiment would be definitive to demonstrate that the GMC-500+ can read moderately high doses with both tubes at once. In any case, it looks that the high voltage circuit can be tuned slightly over 383 V for the stock GMC-500+, just to be sure that both tubes are within their voltage limits at any count rate. I wonder if the voltage drop for 45kCPM in the M4011 tube would be the same if the starting voltage was higher (higher voltage=higher power for same current). Finally, I would remove from the firmware the addition of the CPM values of both tubes, because that makes no sense as ullix and I have said many times! In your pictures/videos, we cannot always know if the CPM shown is including both tube readings or only the tube being tested. Thanks, ZLM. What I see is basically a full confirmation of what I had predicted. I got confused by your initial post which I misread as CPM=120 000, instead of the actually posted CPM=12 000. So now in the videos we saw a 14V drop of the original 383V for a max CPM of 17000, which means a 55V drop when the counter reaches 65000CPM. That covers largely the whole plateau, i.e. a GMC counter with a M4011 will stop working at something around CPM=65000! Why are the MAX values always that much higher than the average? relevant in this discussion is the average, not the max! Note that Cs137 is actually a pure beta emitter! It is the daughter nuclide Ba137 which decays by gamma emission. Hence you get a 100:95 ratio of beta to gamma. 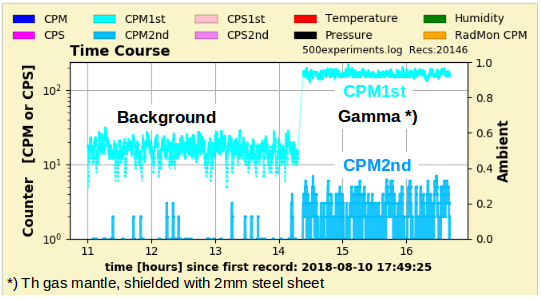 Some Cs sources are sealed in sufficiently thick steel to let only gammas pass, but your sample seems to be too thin for any beta shielding. And the imprint on the source clearly says "beta/gamma". Thus you have a mixed beta/gamma source, just like you have with K40 and the gas mantles. So, one CANNOT draw any conclusions re the sensitivity of the M4011 to the SI3BG to gamma! If you wanted to determine this, you could put a beta absorber between source and tube, and repeat the experiment. As the max beta energy is rather low (~half of K40) a shield from 2mm steel or copper, or 3mm alu, or 100 sheets of copy paper should suffice. The LND7317 is an interesting tube. The reason for it showing much higher count rests clearly on its much larger size and the Mica window, which lets pass a lot more of the betas. (Try here also with the beta aborber described above). Though 5�Ci or 185000Bq is CPM=5.6million (one side of the source is caught only). With a max of CPM=200000 the efficiency even of this tube is <4% only! For the LND7317 experiment, the voltage drop from 670V to 428V is 242V for 201 000CPM. A 14V drop would be achieved with 201000/242*14 => CPM=11600. 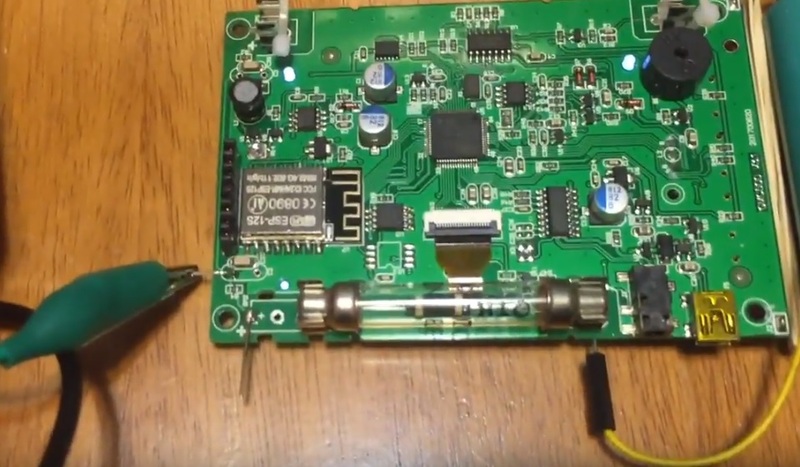 This suggests that the LNB7317 is drawing even a little bit more current than the M4011, but you could manage because you tuned the starting voltage to a much higher level. This means due to the declining voltage, you will count relatively fewer counts at high count rates than at low count rates; you slide down the plateau. The tube will cease to count at around 425V, i.e. around CPM=200k - you were lucky and just caught the maximum! The counter and tubes perform as expected from my earlier experiments. The limiting factor in this counter and all other GMC counters is the high voltage generator. Sorry ullix, but I don't think you correctly understand the Average CPM number. From the manual, the Average CPM is the average reading of the counts per minute SINCE POWER ON. We have no idea what amount of time the meter has been on recording background that has been averaged in unless we look at elapsed time (but that is not shown in this graphic display). You are correct that the Max CPM is not what we want as that rate is likely calculated from extrapolation of CPS. But the number that is important (after sleeping on this and rereading the manual) is the CPM in the upper left corner. That CPM is total counts for the last minute. When the source is applied it starts to rise and when the source is removed it starts to drop. ZLM was careful to only record for one minute with the application of the source and then remove it. So for the first video from the upper left corner CPM number we still get ~17,500 for the M4011 and for the 7317 it is ~200,000. On the second video for the SI3BG tube the number stabilizes at +440 CPM. 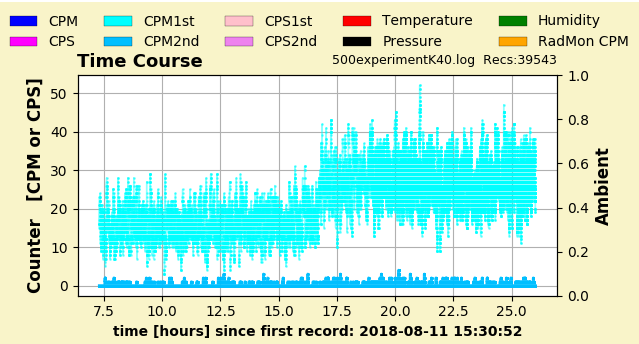 You can watch the CPS graph and note the up and down changes, yet the number of counts increases in the upper left corner till it stabilizes. There is more variability in the number as the tube is so much less sensitive. Of course for this source only. With voltages shown we are certainly at the limit for this counter (in my opinion) regarding the 7317 tube. And very close to the limit with the M4011 tube (Still, I think your 65,000 number is good with PS voltage turned up to 440v and that is 422uSv/hr). I think the SI3BG tube has a long way to go as long as M4011 is removed from device and PS voltage is inreased to top of plateau for the tube. We really do want a hardware switch to turn off M4011 when in incident level fields. The Radex meter states max range tops out 999uSv/h (SBM20 tube). Given what we've seen, with no test report available, I don't believe it. Number of convenience and display limited at three digits. For the $600USD Mazur meter there is a test report that says it will read up to 1250uSv/hr within 10% so I do believe that. More than three times the cost and just the 7317 tube alone accounting for much of that cost increase. But more sensitive low end for sure and PS to support more than three times the counts we're seeing here in ZLM's experiment. But for more than a third less cost we have the added SI3BG tube with the 500+ to take over when M4011 craps out on voltage drop, and I think we need to explore the upper end of that tube's range further with this PS raised to top of plateau voltage and this higher energy source (higher than gas mantles). Also, ZLM got ~450 CPM from the the 500+ and SI3BG. Your RadMon+ voltage drop with counts shown in Reply #31 for the SI3BG shows that highly unlikely. So the RadMon+'s PS has to be significantly different to counts than the 500+. 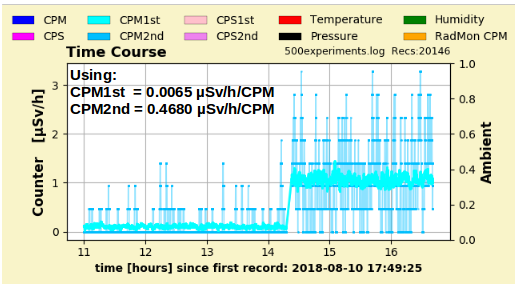 ZLM recorded that ~450 CPM number with still adequate voltage (and from starting at 380v). For the voltage measurement, I want to make clear on how to get correct tube voltage. When the CPM is very low, like background reading <50 for example, they are no difference. They have same voltage. However, when the CPM goes high, the A-C voltage no longer be a stable DC voltage due to the count pulses. So, when measuring the tube voltage while a high CPM reading, the correct measurement points should be between B and C. Otherwise the tube voltage will be incorrectly measured. So you are saying the anode resistor (3M, R4 in diagram). Needs to be incorporated for high CPM. Is that stated in some document that describes how working ranges in tubes are determined? I mean are the numbers in detector specs for working range voltages all measured with the anode resistor included? I have not done that, but would like some published documentation (reference) that supports what you have said. The R4 is for limiting the HV current to tube when counting. I think that controls quality of the counting pulse from tube too. I used B-C points to check the voltage. This may explain why my voltage has some differences. But what measure (AB or EC) is used for the tube spec? If it is AC, then the tube will fail due to counts. It looks like many more counts are viable if BC is correct and you certainly see a LOT more counts than ullix predicts from his voltage drops. Ullix, are you including the anode resistor in your measurements? 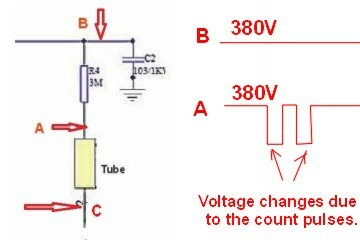 The tube only works within working voltage range(DC 330-380V here). The resistor limited the tube discharge current on each pulse, during the discharge time, the voltage on tube may drop to between 0-330V. That is tube dead time voltage. It needs time to recover back to tube voltage (330-380V here) in order to discharge again. We do not want to check the tube dead time voltage. We need to know how high the tube voltage the PS can provide during the high CPM. Thanks, and the tube specs specify the anode resistor size/range so it fits that it is expected to be a part of the measurement. You might look at your sticky link on measuring the voltage of the tube where someone asks about if he should measure AC (at the ends of the tube). 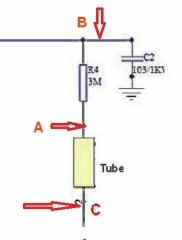 I think my impression from that thread is that you do use the ends of the tube (AC) and maybe you should edit response with diagram above to clearly indicate including anode as in BC. Thanks. The tube cares only about its voltage, more precisely the voltage difference between its anode and its cathode, and not about anything else in the circuit! A plain resistor in series with the tube will see the same fluctuating current that the tube sees. But since its resistance in less than that of a tube between conducting and not conducting, the signal at the resistor will change accordingly less during a pulse. Left shows tube anode_vs_gnd voltage (blue) and voltage between your point B and GND (yellow). You see the pulse in both traces. What you also see is that the voltage at CPM5000 (left) is lower than at CPM=20 (right). When you measure at point B you get a voltage higher than what the tube sees. Relevant is what the tube sees. Use an oscilloscope if you want to avoid averaging over the pulse period with a DVM. But clearly ullix, ZLM achieved 449 CPM with SI3BG and voltage was still fine. He achieved 43443 CPM with M4011 and voltage was still fine. The only measure that was critical was the 7317 detector that was at its max start voltage of 425v. Not likely to get more out of that. Certainly the voltage is dropping with increased counts, but not as much with B-C as you point out. You say in Reply #17 that the 500+ PS won't support above 11,200 CPM for the M4011 and then in Reply #31 that it can't support 60,000 CPM, but we're getting close at 43442 CPM and the voltage hasn't been adjusted to 440v at the top of the plateau (still at 383v). So with that in place we might do much better than 60,000 CPM (you now mention 65,000CPM is likely in Reply #86). And I also think we need to explore the top end of the SI3BG capability and if the 500+ keeps counting well below the max start voltage with A-C measure then the specs have to be describing a B-C measure. The 449 CPM is relatively low count. Each count is about ~11uS width, the total time is about 0.00493 second. For one minute, this 449 CPM only consumed about 0.00493/60 = ~0.0082% of total HV power. That almost can be ignored for power consumption in one minute. This is why the HV voltage drop is not noticeable. In first testing LND7317, the CPM = 201000, total time for this count is ~22110000 uS = 22110 ms = 22.11s. That is about ~36.9% of a minute. So, the total voltage should drop about 36.9% of the preset tube voltage of 670. Which is about ~247V drop. This is very close to our actual measured 242V drop. If the HV PS is not a problem, with the pulse with 11uS for each count, and 4uS recovery time, we can calculate the maximum CPM we can get is about 4,000,000 CPM. So, we need a stronger HV power supply for LND7317 to get 4M CPM. With 3M ohm resistor, we need a 670/3Mohm = ~223uA, 670V power supply. Yes, for 450 CPM you dropped 2 volts across the tube and anode resistor (BC measurement). The working range of the tube is 380V to 460V. So you have a plateau width of 80V. 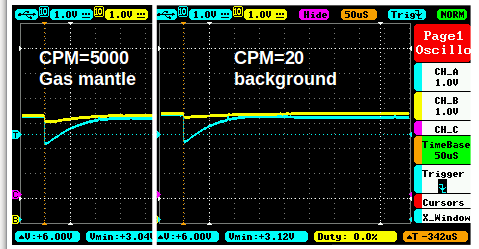 For roughly 500 CPM per two volt drop you have 40*500 or 20,000 CPM the 500+ PS should be able to support with PS cranked up to 460V before making a measure (and of course slope is present to affect things). So 20,000 CPM at .6298 conversion factor is ~12,600 uSv/h. That's ten times the upper tested limit of Mazur 9000 (1250 uSv/h). Logic gotta be faulty somewhere there, but that sounds good to me. Oh, as to effect on human, stay in that field for an hour and you get about 5,000 uSv/h shy of dose received for a medical PET scan (17,450 uSv). If we saw that reading we would certainly want to leave as soon as possible. ullix, I understand what you're saying, but I asked about the voltage that is used in the specification sheet for the tube. An anode resistor is recommended in the spec. What documentation or reference can you provide that the voltages for the tube in the specs are not measured without that anode resistor in series? Can you provide a spec sheet that explains the voltage measured that specifically says anode to cathode voltage and not the system voltage with anode resistor? I have't been able to find one but discussion concerning measurement in other places seems to say you want to have a resister in series to eliminate stray capacitances. As well, with each discharge the anode to cathode voltage of the tube goes way below the working range (and the starting max) voltages. So recovery is necessary before the tube can discharge again. The power supply if not damaged will recover to same level whether anode resister is in series for measure or not. So we are really only interested in recovery voltage for the next discharge. If we're pulling the PS down with many counts, you certainly will see that with the anode resistor in series for the measurement so the voltage should be valid. I leave it to you to google for the specs. The tubes' specs all state a need for an anode resistor. This may have to do with the early power supplies potentially delivering more power than needed, and the resistors limited current flow so the tubes won't light up as light bulbs. The capacitive issue is relevant when there are any long leads from HV to tube. Then you mount the resistor immediately at the anode. For the GMC counters this concern is not relevant, as you can't get any closer to the anode as you already are. Well, I really can't 'rest assured'. Might be common practice and I am simply ignorant. But you learned it somewhere and if I have googled it and can't find anything then it's not clear (also I don't read Russian). Also you don't comment on the whole dead time drop averaging in when the tube actually conducts, and even your oscilloscope doesn't show that for that moment the resistance goes to essentially zero. So the voltage is already going to zero across the tube for that moment and the only thing that matters is when it recovers, and the stability of the power supply to support it. We've seen that the recovery voltage drops in both situations (AC, BC), but the anode resistor supported measure doesn't drop as far. Both appear to need the same time to recover and they appear to recover to the same place (the recovery voltage drops the same amount at recovery with increased CPM) albeit the BC measure doesn't have dead time low voltage averaged as you comment on as it is averaged in by the meter, but your oscilloscope shows it does. ZLM makes the better argument for BC and you actually support it with your oscilloscope display. For me it's all about the CPM. You asked for data and ZLM provided it and it says the 500+ is much better than you have said it's limited to. You've had to continually adjust your limits upward. ZLM has acknowledge that the PS is a limiting factor. Yet we now also see that the SI3BG plays the high end part intended by GQ and does so quite nicely fitting the switchover part of my measurement charts pretty much as I made them within a week of getting the 500+. The 5 uCi source allowed that. So I am left with my original expectations pretty much intact. The M4011 tube meets the 30,000 CPM crossover point in GQ's original firmware settings, and the SI3BG tube looks like it can handle (with PS tweak to top of plateau voltage) ~12,600 uSv/h (advertising to 42,500 uSv/h relates to counter limits and not what the device will actually measure in my opinion). It does need a hardware switch to run the tubes one at a time without the other interfering with the joint PS. I appreciate all the effort and information presented here. I want to better understand my CD-V 717 ionization chamber meter (see if it actually works) and duplicate some of what's presented here for response of 500+. I've ordered a 5 uCi source disk ($110 USD) and with the 500+ giving 282 uSv/h (43442 CPM * .0065), we're looking at 30 mR/h and 8.5 times more activity than the gas mantles (43,442 CPM vs 5,100 CPM). On the 717's 0-5 R/h display, that's three chart division movement at the .1X setting. Ought to at least see movement of the needle where I couldn't clearly see anything with the gas mantles.